Metatrader alerts are messages that can be generated by custom indicators or experts when an event happens. Alerts can be sent to mobile phones, email addresses or displayed in the trade terminal as a popup message. In Metatrader, terminal alerts are always enabled. 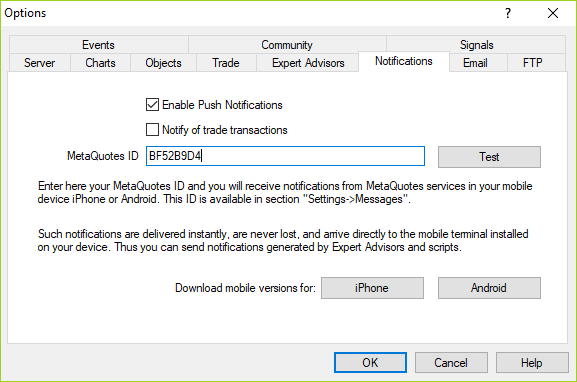 Email and phone alerts first need to be enabled in the Metatrader options panel. To receive phone alerts you will first need to download and install the Metatrader application on your phone or other device. Please see this page for full instructions. Once the app is installed you should receive your own MetaQuotes ID. Next go to the desktop Metatrader terminal window and click Tools->Options. Alternatively, just press Ctrl-O together. Click on the panel labelled Notifications. Click the check box to enable push notifications. Then enter your own MetaQuotes ID into the box provided. Click Test to make sure everything is working. Any phone notifications should now be sent to the device where the app is installed. 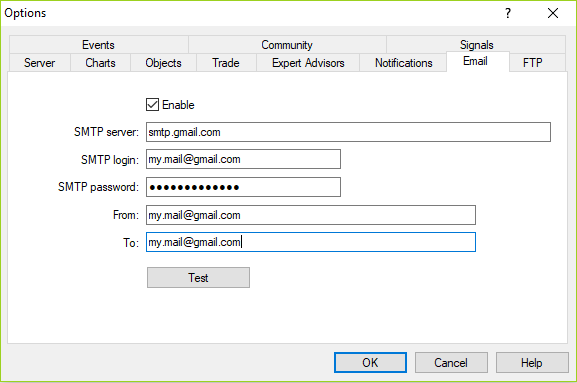 To configure email alerts go to the desktop Metatrader terminal window and click Tools->Options or just press Ctrl-O. Click on the panel labelled Email. At the top you will need to specify an SMTP server address from where messages will be sent. Check with your email service provider to obtain the necessary SMTP server settings. See these pages if you are using Gmail or Hotmail. For other services you should be able to locate their settings from their help pages. Note that there may be some limitations on sending mail through free email services. Check with your service provider. Next enter the password for your email service, followed by the address where the mail will be sent to and where it will be sent from. Click Test to make sure it works. 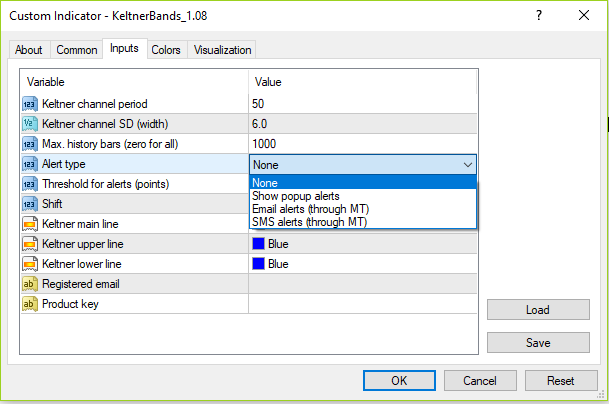 Indicators that generate alerts will have an input setting to allow you to choose between terminal, email or SMS alerts. Select the required setting from the drop down menu. Alerts may be deactivated in free trial versions. Please check the user guides for details.